The Beer-Lambert law is part of the introductory chemistry curriculum. It’s an abstract topic that sometimes gets glossed-over in intro chem courses. Our goal is to use video to make abstract concepts clearer by allowing students to make concrete observations and measurements. Most Beer-Lambert law labs and activities focus on the light absorption vs concentration of a solution. We have activities like that. But chemistry teacher Greg Dodd suggested this idea where students compare the light passing through beakers of colored liquid to apply the Beer-Lambert law looking at absorption compared to path length. The beakers in the video are illuminated from below, and observed from both the top and the side. 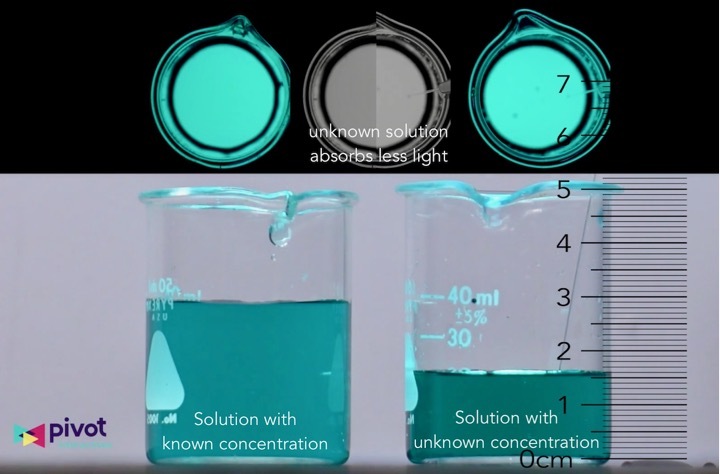 An liquid of unknown concentration is gradually added to one beaker, while a solution of known concentration sits in a second beaker for comparison. What’s great is that does not take much instructional time. Students can make measurements and observations from the video in just a few minutes of class time, and work in groups to figure out how to find the unknown concentration.